When we talk about Google, we think of its network. Google’s backbone network is one of the biggest and fastest in the world. Google even laid their own fiber optic cable under the Pacific Ocean! Imagine your server running on the same network as Google Search and YouTube… That’s a cool thought, isn’t it? And it is now possible with the Google Cloud Platform (GCP). The Google Cloud Platform offers an accessible suite of cloud computing services that runs on the same incredble infrastructure that Google uses. But it must be complicated, right? You do not need a Google Cloud certification to launch your web application server on the GCP. 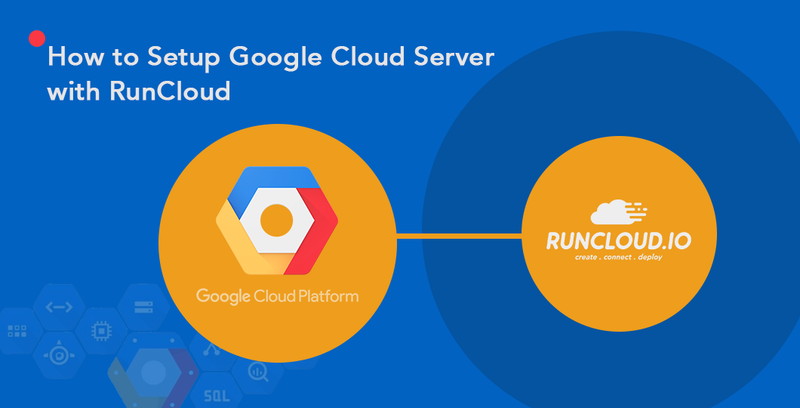 By using the RunCloud cloud server management panel, you can launch and manage your web application server on Google’s backbone network in under 10 minutes. In this tutorial, we will show you how to create, connect, deploy a Google Cloud server with RunCloud (Video tutorial included). Tip: You can get free GCP credit worth USD300 to use within 12 months, and access to the Always Free tier to try GCP with no charge. Login to your Google Cloud Platform account. 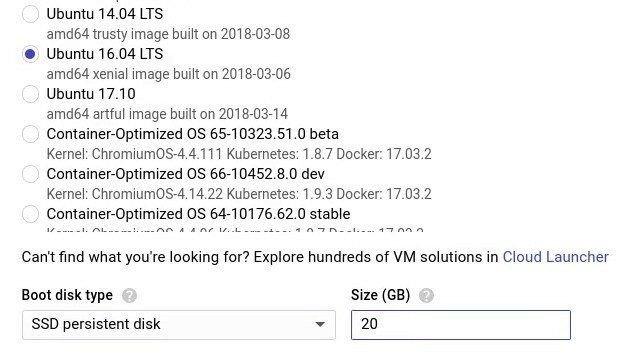 From the left sidebar, go to “Compute Engine” > “VM instances”. 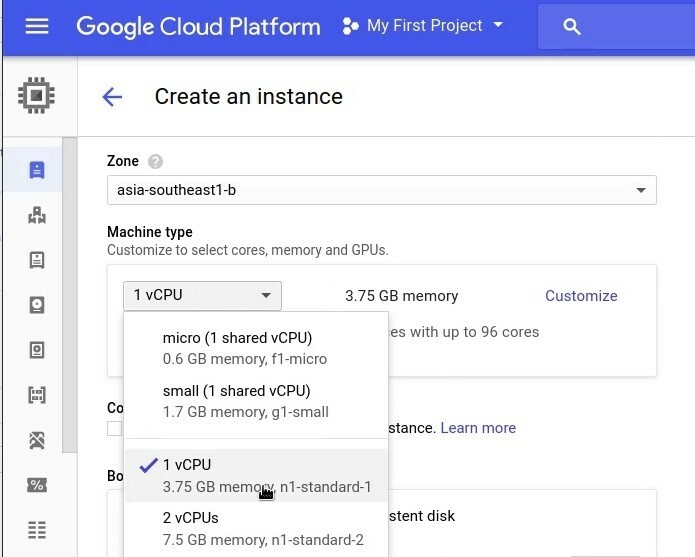 If you do not have an existing VM instance, click on the “Create” button on the VM instances page to create your first GCP instance. Else, click the “Create Instance” button at the top menu bar to create another new instance. Give your instance an awesome name and select a zone (location) for the instance. 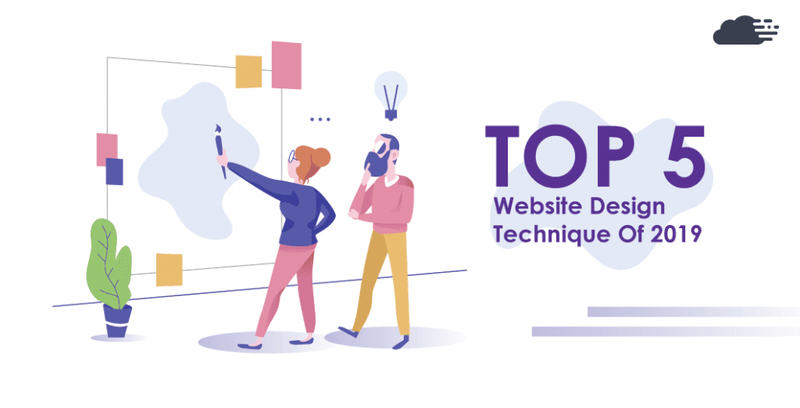 I recommend you to use a zone that is nearest to your target users/visitors to benefit from the lowest latency possible. Under Machine type, select one of the predefined GCP machine types for your instance. Each machine type gives you a certain number of vCPUs (virtual Central Processing Unit) and amount of memory. If none of the predefined machine types match your needs, you can create your own custom machine type by specifying the number of CPUs and the amount of memory for your instance. Next, you need to attach an Ubuntu 16.04 LTS boot disk to your instance because RunCloud only supports Ubuntu 16.04 at the moment. Click the “Change” button under Boot disk, then select “Ubuntu 16.04 LTS”. For Boot Disk Type, use “SSD persistent disk” for better performance. Or, use “Standard Persistent Disk” if you want to reduce your storage costs. The boot disk size is customisable from 10 GB to 65,536 GB. Finally, make sure you tick both “Allow HTTP traffic” and “Allow HTTPS traffic” under Firewall section. This is important so that your Google Cloud server is accessible on the internet. Click the “Create” button to build your Google Cloud server (instance). Now you have a server on the Google Cloud Platform! By default, Google Cloud instances are assigned an ephemeral external IP address. This means a new ephemeral IP address will be assigned to your instance whenever it is stopped and started again. 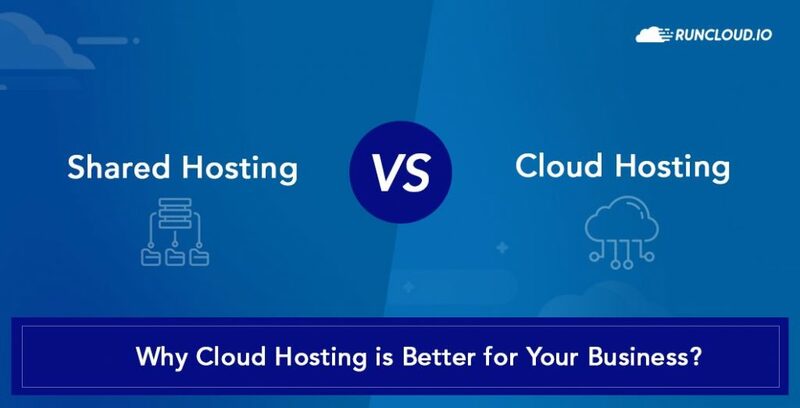 RunCloud is not able to manage your server if its IP address changes without reconfiguring the connection on every change (see the tip below). We need to assign a static IP address to our GCP instance to connect it to the RunCloud platform. Find your instance’s External Address. Click “Ephemeral” under Type, then select “Static” from the dropdown menu to reserve the current (ephemeral) IP address to your instance (static IP address). The IP address type will be updated to “Static”. Now your GCP instance has a static IP address. 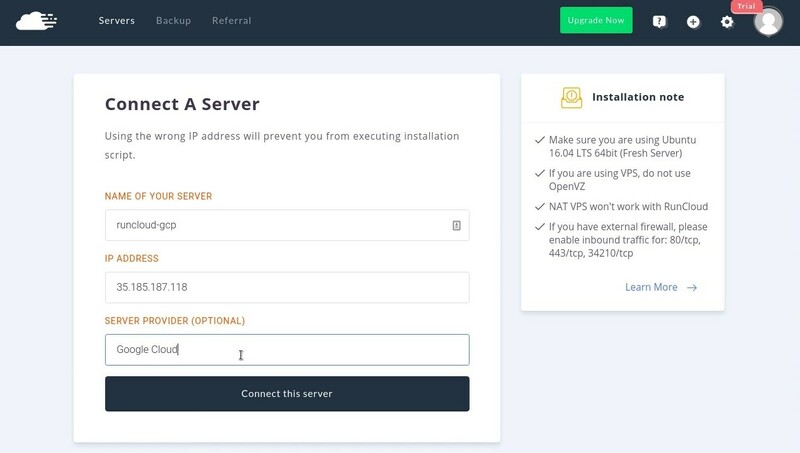 Tip: In case your RunCloud managed server’s IP address does change, you can use RunCloud’s Change IP Address feature to update its IP address and reconnect it to RunCloud. In order to allow RunCloud to communicate with your Google Cloud server, we need to open the RunCloud port (TCP port 34210) at your GCP Firewall. It will allow all incoming traffic from any IP address to your server’s TCP port 34210. You can read more about the firewall rules at Google Cloud documentation. The opened TCP port 34210 at GCP firewall will be protected by RunCloud’s firewall at your server. Now your Google Cloud server is ready. RunCloud can connect to it and add some magic. 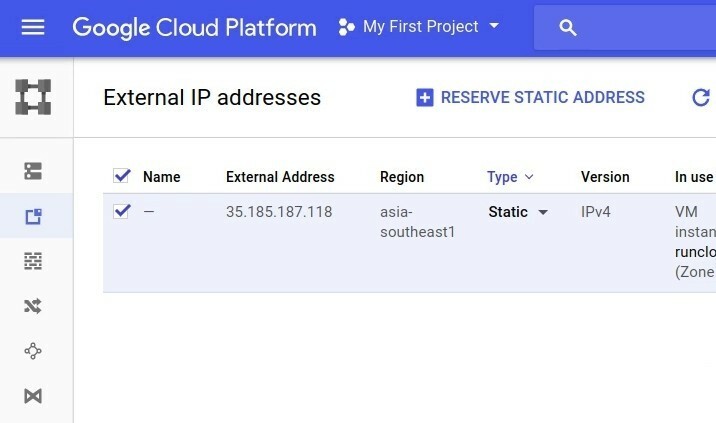 Login to your RunCloud panel and connect a new server using the GCP instance’s external IP address. Copy the RunCloud installer script command provided. Back to GCP console and find your server under VM instances. Click on the “SSH” under Connect to launch GCP web-based terminal and run commands on your server. We need to run the RunCloud installer script command as “root” user but GCP does not provide “root” password. We can use command sudo -s to start a “root” shell. Then, paste and run the RunCloud installer script command. Sit back and enjoy the magic show! The RunCloud installation will take a few minutes to complete. You can check the installer progress at the RunCloud panel too. Once it is completed, write down the MySQL root password, username, and password. This is important! Back to the RunCloud panel and you will see your Google Cloud server’ summary. Now you can deploy your web applications on GCP with a few clicks! In this tutorial, you learned how to create a custom Google Cloud server that matches your needs and assign a static IP address to it. You also learned how to add a custom GCP firewall rule to open a port for RunCloud. Now you can use RunCloud panel to manage your Google Cloud server and web applications.